MLB’s only official baseball card manufacturer, Topps, is running a super-fun photo competition. Thirty fan-submitted photos will be used for the 2015 baseball card set. Imagine the delight baseball fans will get seeing their own photo appear on a baseball card! To enter just your photo on instagram with the hashtag #toppslive and it’s automatically in the competition. Everything sounds great, except when you look at the terms of the competition. All entries become the property of the Sponsor and will not be returned or acknowledged. 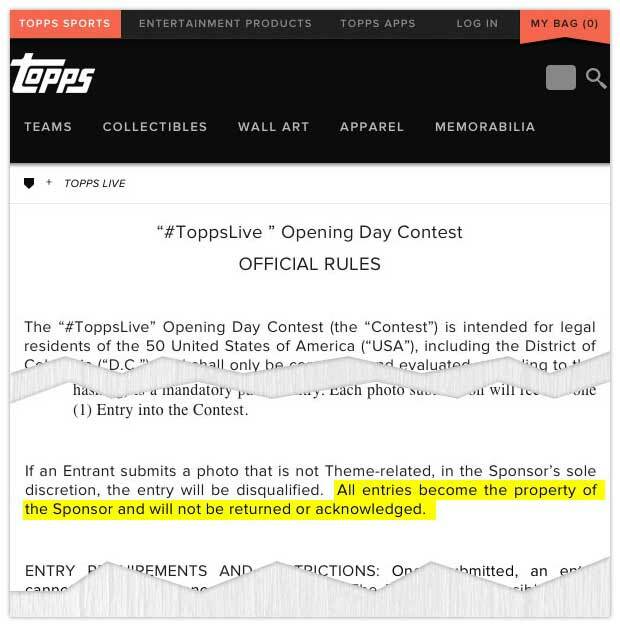 Meaning, even if your photo is not picked, it still is property of Topps. ALL the submitted photos become the property of Topps. All of the sudden this competition became super-not-fun. Imagine the horror baseball fans will get seeing their photos become Topps property–even when their photo is not selected. The only photos that should become the property of Topps are the thirty photos that are selected to appear on baseball cards for 2015. All the cards shouldn’t become their property. But then again, does that mean if I submit a photo, I’m now an official Topps photographer? Perhaps I can put that on my resume, along with the millions of other Instagram photographers out there. Also, what will Topps be doing with a 612 x 612 low-resolution photo that Instagram uses? Seriously. These days Topps is all about quality. While the competition is a fun idea, the photos will be extremely low-quality. But perhaps the whole aura of user-generated content–especially content from Instagram–the king of low-quality photos.